Treat your little campers to a fdun outdoorsy treat that can’t be beat! This treat may look earthy, but it tastes like heaven, with soft chocolate sponge cake rolled up with a cream cheese mocha filling and slathered with luscious bittersweet chocolate frosting. Recipe below includes copycat Swiss Rolls, to save time you may use Hostess Swiss Rolls. 1. Mocha Filling: In a small cup, stir together espresso powder and coffee liqueur until dissolved. In a food processor, combine the cream cheese, confectioners’ sugar and coffee mixture until smooth. Refrigerate 1 hour. 2. Chocolate Sponge Cake: Heat oven to 400°F. Lightly coat a 151⁄2 x 101⁄2 x 1-in. jelly roll pan with cooking spray. Line with parchment paper and coat with spray. Dust with 2 Tbsp cake flour, tapping around pan to coat completely. Tap out excess flour. In a small bowl, combine remaining 1⁄3 cup cake flour, cocoa powder, baking powder and salt. 3. In a large bowl, on medium-high speed with handheld mixer, beat egg whites until foamy. Gradually beat in 1⁄2 cup of granulated sugar. At high speed, beat whites until stiff yet billowy peaks form. 4. In another large bowl with same beaters (no need to wash beaters), beat egg yolks and remaining 1⁄4 cup sugar on medium-high speed 2 minutes, or until thickened and pale. On low speed, beat in extract, then flour mixture. Stir 1⁄4 of the beaten whites into yolk mixture to lighten (prevents whites from deflating). Fold yolk mixture into remaining whites. Spread batter into prepared pan in an even layer. 5. Bake 12 minutes, or until cake is puffed and top springs back when lightly pressed. Heavily dust a clean kitchen towel with about 1⁄3 cup confectioners’ sugar. Invert hot cake onto dusted area of towel. Remove pan; carefully peel off parchment paper. Starting from a long side, tightly roll up cake with towel. Place seam side down on wire rack. Let cool completely. 6. 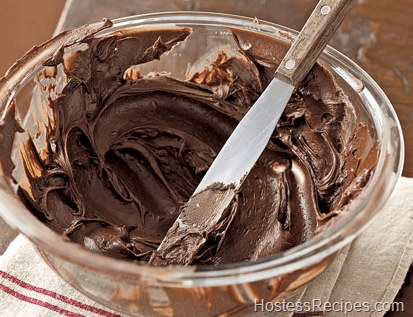 Chocolate Frosting: Combine cream, butter and corn syrup in a 1-qt glass measure; microwave on high 1 1⁄2 minutes or until simmering. Add chocolate; let stand 3 minutes. Whisk until smooth. Let stand 30 minutes or until mixture has thickened to consistency of canned frosting. 7. To fill cake: Carefully unroll cake on cutting board (leave on towel). Spread cake evenly with mocha filling. Starting from a long side, roll cake into a log. Lift log onto a sheet of plastic wrap; wrap and refrigerate, seam side down, until filling firms. 8. To assemble log: With a serrated knife, cut off a 3-in. diagonal slice from one end of the log and a 2-in. diagonal slice from opposite end to use as branch stumps. Place log, seam side down, on a slight diagonal on serving platter. Using photo as guide, attach the 3-in. stump to side of cake with some frosting to form a Y shape. Place remaining 2-in. stump on top of log, near opposite end of the Y, with cut end pointing in the opposite direction from other stump. Using small icing spatula, frost log and stumps, applying frosting in long smears to resemble coarse bark, but leaving all cut surfaces unfrosted to expose filling. Refrigerate log at least 2 hours to harden frosting. 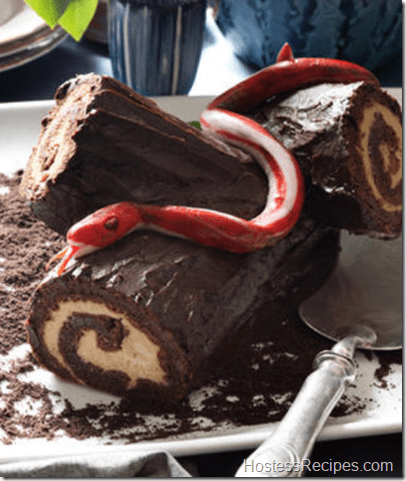 Drape fondant snake on top of log, if using. Fondant Snake: Using red gel or paste food color, tint 1⁄4 cup white fondant; pinch off a pea-size ball and shape into snake’s tongue. Roll remaining fondant into a 12-in. rope about 1⁄2 in. thick. Roll 2 Tbsp white fondant into a thinner 12-in. rope. Roll the white and red ropes together until 18 in. long. One inch from an end, pinch roll to make head. With scissors or knife, cut a horizontal slit to make mouth; insert tongue. Cut a chocolate-covered raisin or cranberry for eyes and nose.